Ocean liners also have galleys (kitchens) and dining rooms to feed the crew and passengers. Mmost have lounges, libraries, and game rooms for people to relax in during their voyage. Some have ballrooms and theaters, too. 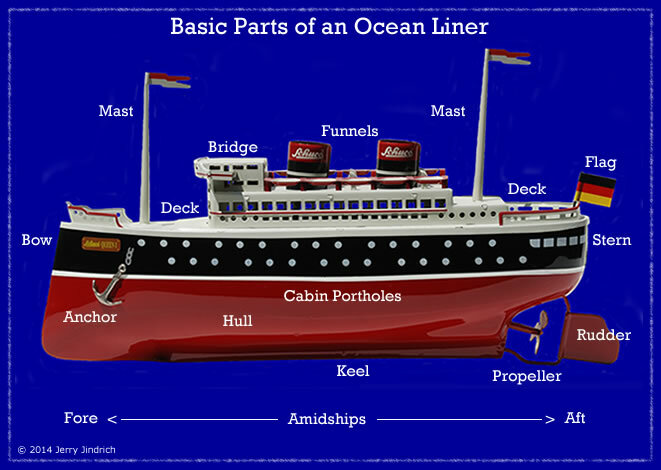 Ocean liners carry fewer passengers than cruise ships and are built differently to travel swiftly and safely across oceans rather than to simply cruise slowly around in calm waters. © 2014 Jerry Jindrich. All rights reserved. Revised 1/25/2016.